Tireless efforts over more than a decade have resulted in stunning achievements in China’s new energy development. The country has realized a structural transformation as it shifts from traditional fossil fuels such as coal to a package of clean solutions including nuclear power, hydropower, wind power, solar energy and biomass. According to statistics from China National Renewable Energy Center and China Electricity Council, by the end of May 2018, the installed capacity of hydroelectric plants above the designated size reached nearly 300 million kilowatts, installed capacity of wind power 170 million kilowatts, installed capacity of photovoltaic power generation 143 million kilowatts and installed capacity of biomass power generation 16 million kilowatts. In total, China’s installed capacity of renewable energy generation has hit nearly 630 million kilowatts, accounting for nearly 37 percent of the country’s total installed capacity of power plants above the designated size. In the first five months of 2018, the amount of electricity generated with renewable energy in China exceeded 625 billion kilowatt hours, accounting for nearly 24 percent of the country’s total from power plants above the designated size. Non-fossil energy power generation has topped 731 billion kilowatt hours, accounting for more than 27 percent of the country’s total from power plants above the designated size. New energy and renewable energy have already become the main force for the country’s newly added electricity generation capacity, accounting for more than 65 percent of the newly installed capacity in 2017. The substitution role of renewable energy becomes increasingly prominent. China has already formed a complete new energy industry chain covering research, manufacturing, design, construction and operation. The industry has entered a phase of rapid, comprehensive and large-scale development. Localization has witnessed a significant increase. China’s production scales of wind turbine equipment, polycrystalline silicon, silicon chips and photovoltaic cells rank top in the world. New energy already accounts for a major proportion of China’s newly installed electricity generation capacity. And continuously improving equipment, technology and management of renewable energy have led to steady cost declines for wind and photovoltaic power generation. The top 10 enterprises with the biggest installed capacities of wind power in the country produce a total installed capacity of more than 100 million kilowatts. Their manufacturing capabilities for some parts such as blades, gear boxes and generators are on par with advanced international standards. These enterprises are capable of providing reliable supporting equipment for mainstream wind turbine models. And the wind power service industry is becoming increasingly important. In 2017, the production capacity of China’s polycrystalline silicon development enterprises totaled 210,000 tons, accounting for half of the world’s total. With ever improving production technologies, the comprehensive cost of polycrystalline silicon development has dropped to less than 90,000 yuan per ton and industrial efficiency has increased to nearly 19 percent. Total production capacity of silicon chips has witnessed a sharp rise to nearly 82 gigawatts, an increase of 35 percent on a year-on-year basis and accounting for nearly 87 percent of the world’s total. Prices for parts and components have dropped to around 2.5 yuan per watt this year. And the annual yield of components from China is more than 70 percent of the world’s total. To promote the development and utilization of renewable energy resources, increase energy supply, improve energy structure, safeguard energy security, protect the environment and realize sustainable economic and social development, the Renewable Energy Law of the People’s Republic of China was implemented in 2006 and revised in 2009. The law stipulated basic rules and entity responsibility such as guaranteed full purchase related to renewable energy development. Two governmental documents, The 13th Five-year Plan (2016-2020) for Renewable Energy Development and Reform Strategies on Energy Production and Consumption (2016-2030), specified the 2020 and 2030 goals for renewable energy development. By 2020, the proportion of non-fossil energy and natural gas in primary energy consumption should reach 15 percent and 10 percent, respectively. By 2030, the figure should hit 20 percent and 15 percent, respectively. 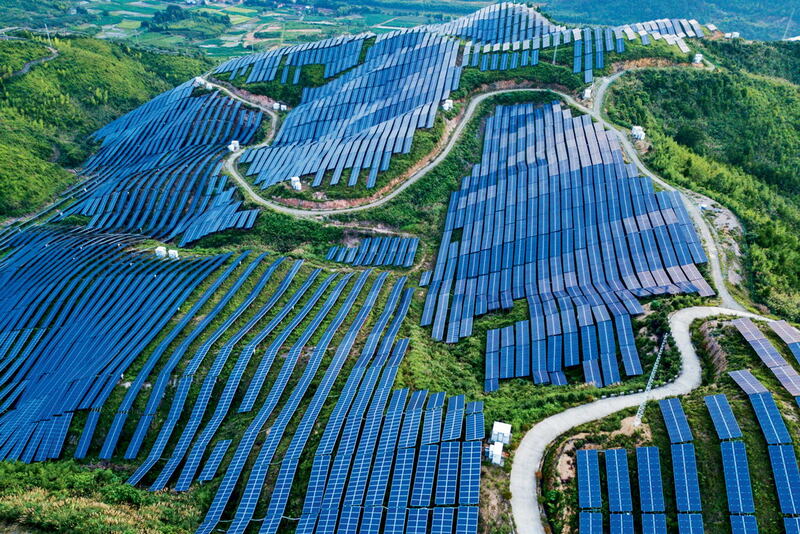 Since the implementation of the 13th Five-year Plan, China has established a series of mechanisms and systems such as a renewable energy objective-oriented guidance system and guaranteed full purchase of renewable energy to ensure the realization of the non-fossil energy’s proportion targets and expand the utilization of renewable energy. By controlling the pace of projects, construction and grid connection, the government has played a more active role in guiding enterprises in rational investment and efficient usage of renewable energy. In February 2016, China’s National Energy Administration issued guidelines on renewable energy development and utilization. It required the country’s provincial-level administrative units to set consumption proportion targets for renewable energy based on their various renewable energy development conditions and energy consumption situations. In terms of supervision and monitoring, the National Energy Administration issued its 2015 and 2016 supervision and assessment reports on the country’s renewable energy power development. The reports evaluated absorption and consumption of non-hydroelectricity and renewable energy electricity of different provincial-level administrative units. Besides, it also covered the policy implementation situation such as guaranteed purchase of wind power and photovoltaic power. In March 2016, China’ National Development and Reform Commission and National Energy Administration promulgated a document specifying measures for guaranteed full purchase of renewable energy. Based on the document, areas that have given up developing wind and photovoltaic power must meet minimum annual purchase amounts for wind and photovoltaic power. Additionally, a supervision and early warning mechanism for wind power has been established. In accordance with Notification on the Results of 2017 Wind Power Investment Supervision and Precaution, China designated red alert areas for wind power development and construction. No new wind power projects are allowed to be established in such areas. The country vowed to take measures to address problems related to abandonment of wind power. Major renewable energy projects such as grid-connection of wind power and photovoltaic power with state-set prices, base construction of leading photovoltaic technologies and solar thermal energy demonstration projects have been promoting technical innovation and industrial upgrade. These projects have also played a vital role in driving industrial scale and structure to higher levels. In 2017, China’s National Energy Administration issued a draft notification on the requirements for the construction of advanced photovoltaic power generation technology application bases. The draft designated the construction scale of each base at 500 megawatts. In three years, the construction of all these bases will be complete, related advanced technologies will reach industrialization and the technical indicators for 2017 industrial leaders should rise. In September 2017, in accordance with pilot work requirements on grid-connection of wind power with state-set prices issued by China’s National Energy Administration, the administration announced pilot projects in areas including Hebei, Heilongjiang, Ningxia and Xinjiang with a total scale of 707,000 kilowatts. Prices of wind power in these projects are required to set the same as prices of local on-grid coal power. And efforts must be made to absorb and consume wind power in local power grids. Although the large-scale development of China’s new energy sector started late compared to the United States and some European countries, its second-mover advantages are obvious and have reaped major benefits. Today, major countries, mainstream media and numerous international organizations all highly recognize China’s achievements in new energy development as well as the contributions of China’s new energy sector in promoting sustainable development in economics, the environment and people’s wellbeing. The development and contributions of China’s new energy sector are considered important and outstanding achievements made by the country during the construction of a modern economic system with Chinese characteristics. Since 2011, both China’s newly installed capacity and cumulative installed capacity of wind power have ranked top in the world. In 2013, China’s newly installed capacity of photovoltaic power surpassed Germany and Italy and has since topped the world. In 2015, the country’s cumulative installed capacity of photovoltaic power beat Germany and became number one worldwide. In 2017, China’s newly installed capacity of photovoltaic power accounted for half of the world’s total. Statistics show that in 2017, China’s utilization of non-fossil energy accounted for nearly 14 percent in its primary energy consumption. Its utilization of new energy ranks top in the world and accounts for 20 percent of the world’s total utilization of new energy. China already boasts the largest utilization of renewable energy globally and has set a model for global energy transformation as well as new energy development and utilization. By now, China’s new energy development has already become the calling card showcasing the country’s soft power. It is also a prime embodiment of the country’s development concepts including ecological civilization, green and low-carbon development, beautiful China and sustainable development. At the same time, the development of the new energy industry is not solely an idealistic mission. It serves as a key component of the advanced equipment manufacturing industry, an important engine for economic development, an effective means for economic restructuring and an efficient industrial carrier which perfectly combines the country’s new development concepts with its new real economy and attracts participation from market entities with various forms of ownership. Against the backdrop of global climate change, international energy restructuring and China’s reform of energy production and consumption, new energy development is looking at tremendous opportunities. First, climate change has driven global energy restructuring. Facing increasingly pressing challenges related to energy security, climate change and ecology, the world’s current energy structure is undergoing profound adjustments. A new round of energy reform has started. Propelled by new energy technology, information technology and pressure from global carbon emissions, green and low-carbon energy development has become a central piece of the reform. Second, China has entered a new era of socialism with Chinese characteristics that requires the country to strictly pursue green development in the energy sector. The report delivered at the 19th National Congress of the Communist Party of China in 2017 made energy requirements crystal clear. The report expounded on the importance of energy development to “speed up reform of the system for developing an ecological civilization and building a beautiful China,” which testified to the importance China attaches to energy restructuring and green development in the new era. The country’s future energy development will follow the general principle of building a clean, low-carbon, safe, and efficient energy system while maintaining a commitment to raise awareness of the need to respect, protect and accommodate nature and stick to the road to green development. Third, China has begun to implement an energy revolution strategy. In accordance with the country’s new development concepts, a blueprint for an energy revolution has been designed. Presently, the pace for energy restructuring has accelerated, and the idea of energy reform has taken root in the people’s minds. Energy development with Chinese characteristics has witnessed new progress. The energy revolution strategy calls for accelerated construction of a green energy supply system reliant on diversified sources to promote sustainable and healthy development of renewable energy.